I’ve only visited L.A. twice, but I love checking out movie and TV locations. I’ve been to Bronson Canyon twice and Vasquez Rocks once, as well as the Universal Studio tour. Yes, I realize that these are not exactly the most obscure locations (and I have many more I want to visit someday), but it’s always a kick to see, say, an old 2-part MISSION: IMPOSSIBLE shot at Bronson Canyon using nearly the same camera setup as a current movie like DRAGON WAR. I think you might be too hard on MANNIX. I think the first year holds up pretty well, basically because Connors is so good. William Link’s audio commentary on the pilot is hilarious, because–predictably, having not had anything to do with it–he has nothing to say about it. 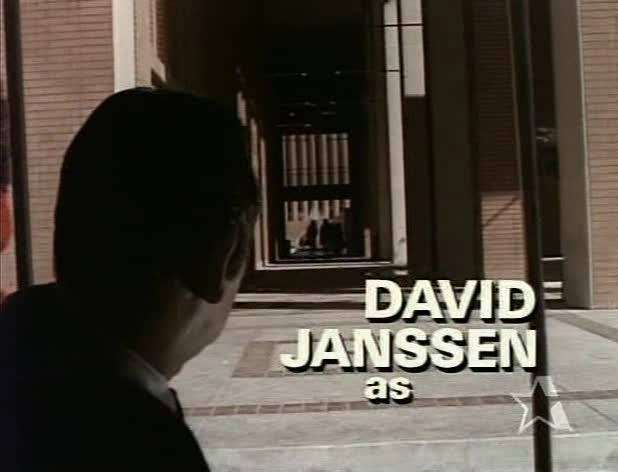 He and Levinson came up with the basic concept and the character names, and that seems to be about it. I also think Howard Browne and John Meredyth Lucas, who was STAR TREK’s story editor for a short time, were finer writers than you give them credit for (hey, different strokes…). Lucas died not many years ago. On a different subject, any stories about one of my favorite TV writers, Stephen Kandel, whose scripts were almost always better than par for whatever show he was doing? I’ll watch just about anything if I see his name in the titles. You’re probably right about Howard Browne and John Meredyth Lucas; they are a bit more distinguished than the other writers I named. I haven’t seen a lot of Browne’s work for Roy Huggins, but he wrote an atypical Fugitive episode, “A Clean and Quiet Town,” that’s one of the only episodes to explore the larger ethical consequences of Kimble’s conflict with the law. Lucas’ work is uneven, but he wrote some good Ben Casey scripts and a Medic episode that I even included in the “Top 100 Greatest Television Episodes” piece on my website. I spoke to him in the late 90s but he was a reluctant interview subject. Lucas’ memoir, unfortunately, finds his Hollywood childhood far more interesting than his own TV career. Marty, as for Stephen Kandel, it’s as if I’m feeding you the questions. 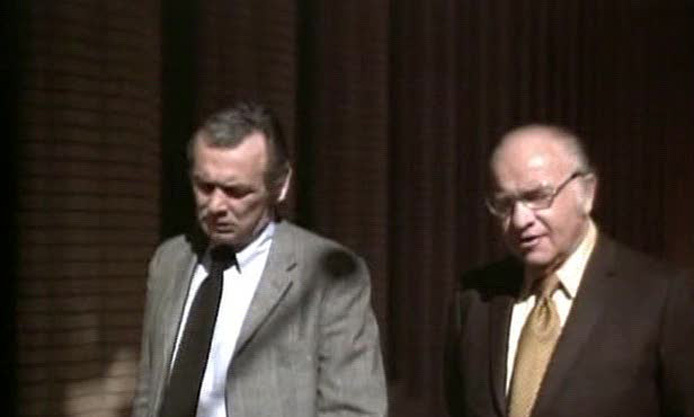 I just recorded a funny and informative oral history with Kandel a couple of months ago, which will see the light of day somewhere … sometime. I know we’ve had these discussions before, but there really could be an entire “Los Angeles Plays Itself” simply focusing on clips from television episodes (or, expanding beyond that, made-for-TV films) with real Los Angeles locations. I bet you’ve already got a huge head start in documenting that, too! As one who grew up in the Sixties (and loved “Mannix,” among others) I can see where the whole “intertec” concept came from. Computers were just starting to come into their own (though only the government and the larger corporations had them in the mid-1960’s), and there was a mystique about them and their supposed “infallibility” that both fascinated and scared people. Questions of whether we’d eventually be replaced by computers were explored ad nauseum in literature and especially sci-fi movies & TV shows. Comedies, particularly by the late 60’s, had taken to making fun of computers (especially that new phenomena “computer dating”), with their “mistakes” providing the punch-lines. I can recall many shows having an episode revolving around computers (“The Partridge Family” and “Love American Style” come immediately to mind). Parallel to the computerization trend was the whole corporate conformity trend, as documented in the book “The Organizational Man,” the movie “The Man in the Grey Flannel Suit” and others.. I suppose it was only natural that someone would try to come up with a TV show that pitted the rugged individualist against the Corporation and it’s Computers. And to wed that idea to the always popular detective show genre must have seemed a natural back in 1966-67. But somehow it just never quite jelled during the first season of “Mannix”. The subtext of the old-fashioned, sloppy Mannix contrasting to the sterile, ultra-modern Intertec never provided nearly as much tension as the actual cases Mannix investigated. In fact Lou Wickersham, besides arguing with Mannix, mainly served to help Mannix out of misunderstandings with clients and scrapes with the police (including bailing him out of jail). 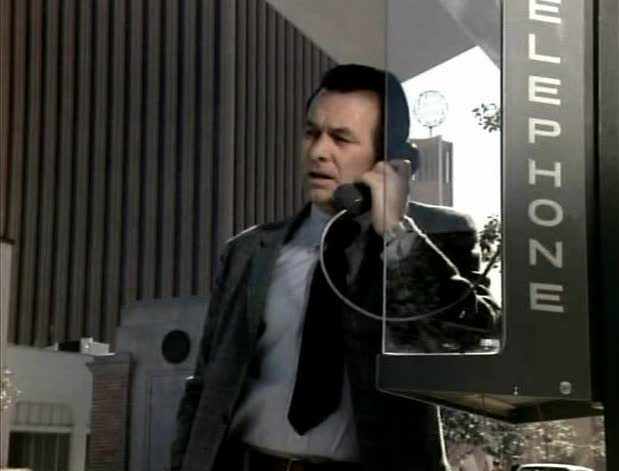 Perhaps because the writers never invested enough time and plot into the Mannix vs corporation/computer narrative, or perhaps just because Mike Conners was so terrific and natural as a detective on his own that the whole Intertec prop seemed superfluous and unnecessary, As you alluded to, the banter between the Organizational Man, Lou Wickersham, and Mannix never had any real depth to it, nor did the research of the Intertec computers. Mannix always “flew by the seat of his pants” and generally disregarded the computers and their abilities, proving that good old dogged foot-slogging could resolve even the toughest case. 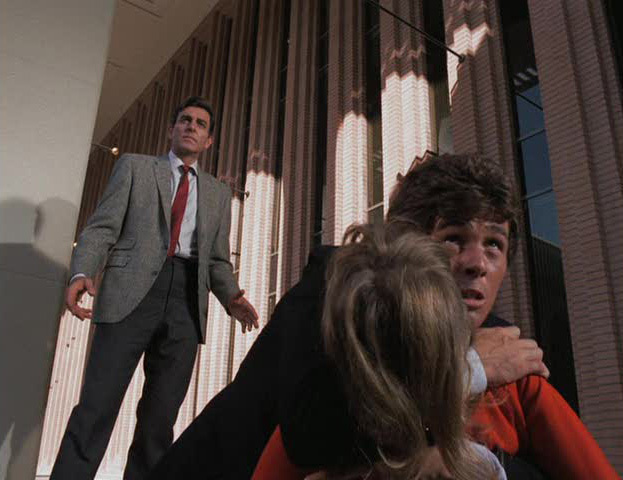 During the rest of the show’s run, Mannix was freed from this unnecessary and time-wasting subplot. He was able to get whatever information he needed to solve a case from Peggy’s research, or some timely help from a friend on the police force. 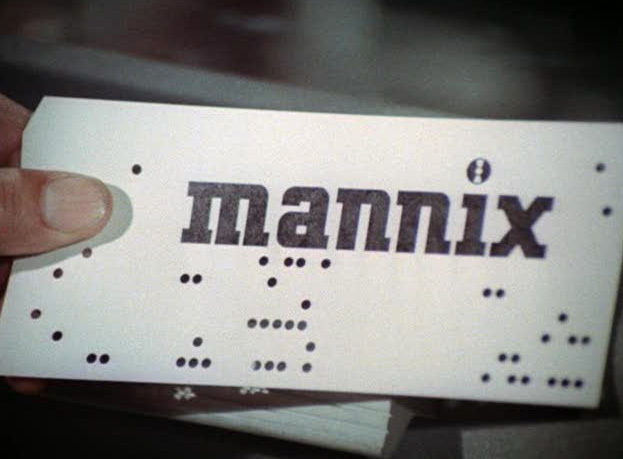 I’m glad they decided to drop Intertec and put Mannix out on his own. By doing so they made “Mannix” one of the most beloved and enduring detective shows of all-time. For a small town boy living in Southern Canada, I enjoyed the Intertec theme it was so cool to see the office building with all the computers , many years later I worked as a guard supervisor for a Toronto Company with the same sounding name. The company I worked for Internal Detective (Intertect). Where is the actual location of The Intertec building, and doeas it still exist? . The actual location of the Intertect Building is 3470 Wilshire Boulevard. At the time it was known as the Tishman Plaza Office Building. As far as I can tell it’s still standing. The Tv story …My mother loved Mannix. 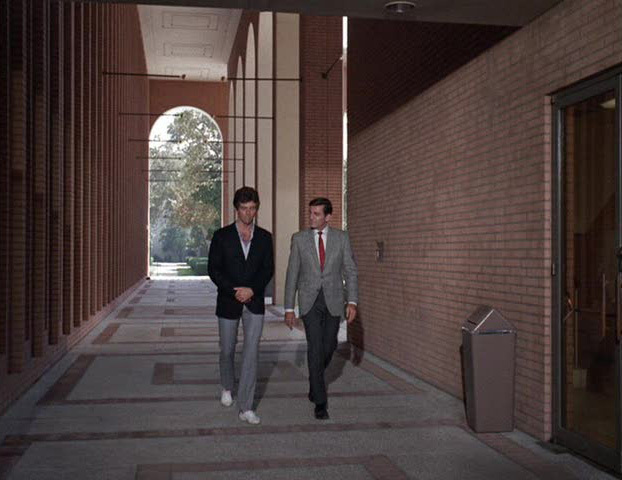 Was Mannix’s office a set or a place in California? Interior was a set. Exterior was on the Paramount lot. Thank you. I take it that none of it exists anymore? It actually looked really nice. It seemed like a nice place to walk through with the architecture and the set up with the fountain and everything else if it had been a real place. I wanted to see if it existed when I was in Los Angeles last month. At least I got to see the Bat Cave and Rockford’s Paradise Cove.